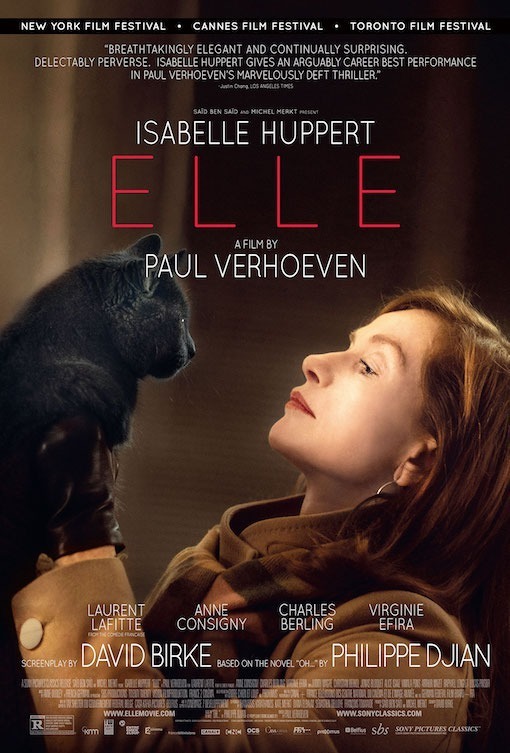 Directed by Paul Verhoeven (Basic Instinct, Show Girls) Elle stars Isabelle Huppert as a fifty-something business woman, attacked and raped in her own home. Elle, based on the French novel “Oh’’ by Philippe Djian, is currently in theaters now. For today’s Slacker Sunday post, instead of a video, I’ve got a podcast featuring a fascinating conversation with Isabelle Huppert at the Landmark, one of LA’s favorite places to see independent, not exactly mainstream movies. Below that a smattering of opening lines from the reviews the film is getting. I've been working on my own project lately, barely having time to write my daily posts so I've got a big backlog of movies based on books I need to get to. This is one of them. Beautifully made with exquisite taste and eye for detail, “Elle” is pretty, but it can’t be described as a pleasure to watch. A masterpiece of suave perversity, the movie leads its audience through a meticulously constructed maze of ambiguity, scrambling our assumptions and expectations at every turn. Audiences arriving for a lurid slab of arthouse exploitation will be taken off-guard by the complex, compassionate, often corrosively funny examination of unconventional desires that awaits them. Sim, Yes, this looks like a challenging movie, but I'm very curious. Will you see it?